We had lost the File Factory Hollow somewhere towards the top, and ended up bushwacking off a spur to the summit of Limekiln Mountain. Near the summit we found a grove of blueberry bushes which had sweet ripe blueberrys and we all had our fill. After hitting a viewpoing and losing my bearings, I needed to check my GPS to get our exact position, and I noticed we were above the summit of Limekiln Mountain. 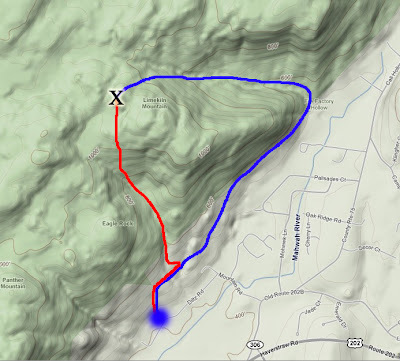 So we bushwacked down and hit the TMI Trail and took the TMI trail back to the trailhead. due to all the recent rains. Shimmy in front of talus near the summit. Me picking the Blueberries and bottling them. Eagle Rock and RCC in the Distance.